This distinguished surname, with five Coats of Arms, and having several notable entries in the "Dictionary of National Biography", is of Old French origin, and is an occupational name for a fencer or fencing-master. The derivation is from the Old French "eskermisseo(u)r", fencer, from "eskermir", to fence, skirmish, fight hand-to-hand (Middle English "skrymsher, skirmisour"). Fencing-masters always found plentiful employment in medieval times, although the keeping of fencing-schools was forbidden in the City of London because of their dangerous influence. Job-descriptive surnames originally denoted the actual occupation of the namebearer, and later became hereditary. Early examples of the surname include: William Lescermissur (Suffolk, 1180); Symon Leskirmisur (Essex, 1221); and Gilbert le Skermisur (Warwickshire, 1222). 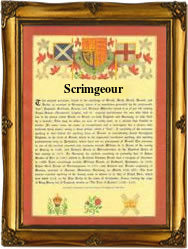 A family by the name of Scrymegour had the position of hereditary standard-bearers of Scotland. For his services in this office, Sir Alexander called "Schyrmeschur" was granted lands in Forfar in 1298, and became Constable of the Castle of Dundee. Another, Sir James Scrymgeour, a favourite of James V1, succeeded to the hereditary offices of standard-bearer, and Constable of Dundee in 1576. John Scrymgeour, second viscount Dudhope, was created Earl of Dundee in 1660. The family Coat of Arms is a red shield with a gold lion rampant, armed and langued azure, holding in the dexter paw a silver scymitar, the Crest being a lion's paw holding a scymitar. The first recorded spelling of the family name is shown to be that of Richer le Schirmissur, which was dated 1154, in "Documents relating to the Danelaw", Lincolnshire, during the reign of King Henry 11, known as "The Builder of Churches", 1154 - 1189. Surnames became necessary when governments introduced personal taxation. In England this was known as Poll Tax. Throughout the centuries, surnames in every country have continued to "develop" often leading to astonishing variants of the original spelling.